… but you can still visit him in Budapest! Though Bela Lugosi died (or DID HE?) in 1956, he was immortalized by his iconic turn as Count Dracula, Hungarian Homeboy. The Kinks, Bauhaus, and Andy Warhol have all paid homage to Bela. And now he can claim architectural immortality as his likeness adorns a Hungarian castle. 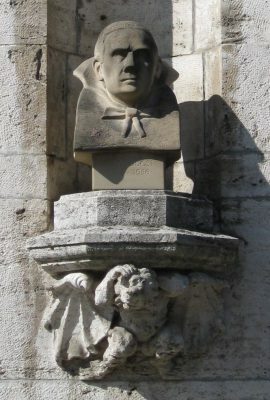 Late one night in 2003, a bust of the Dracula star was stealthily placed on the façade of Vajdahunyad Castle, a Budapest landmark, where it remains to this day. A must-see on the Eastern Europe Vampire Tour circuit! Read the entire article at Atlas Obscura!